Delta Prince, backed down to 2-1 favoritism even though he was making his first start in almost 10 months, rallied resolutely on the outside under Javier Castellano for a going-away 1 ¾-length victory in Saturday’s $182,350 King Edward Stakes. The Grade 2 King Edward, a one-mile turf race for 3-year-olds and upward, attracted a field of eight and Delta Prince was making his local bow for trainer Jimmy Jerkens. Delta Prince, breaking from the outside, broke well but settled back as Shakhimat shot up to hold a two-length lead through a quarter in :23.77 and a half in :46.58. Caribou Club and First Premio were stalking in second and third place, with Delta Prince running next in line. The 19-1 shot Shakhimat, trained by Roger Attfield, was challenged by Caribou Club around the final turn, but the leader kicked away again turning for home and was still in front through six furlongs in 1:09.11. Delta Prince, who had launched his bid around the final turn but then seemed to stall briefly, was roused in early stretch and gutted it out to outfinish a stubborn Shakhimat in a final time of 1:32.35, just .20 seconds off the track record set by Wise Dan in the 2015 edition of the Woodbine Mile. Conquest Panthera rallied from last place to get up for third, just a neck behind Shakhimat and a length before fourth-place Caribou Club. Rounding out the order of finish were First Premio, Tower of Texas, Ring Weekend and Hollywood Hideaway. A lightly-raced 5-year-old homebred son of Street Cry and Delta Princess, Delta Prince was recording his first stakes win in the King Edward. The Kentucky-bred, who last saw action September 4 when third in Saratoga’s Grade 2 Bernard Baruch, was coming off a third-place finish. That race was won by Heart to Heart, who went on to win two Grade 1 stakes races this year. Owner/breeder Frank Stronach, on hand for Saturday’s race, said the dark bay’s time away from the races had been a minor concern. “We had a few problems, but Jimmy Jerkens has always been really high on him,” said Stronach, adding that Delta Prince is a half-brother to three-time Eclipse Award winner champion Royal Delta. Stronach also agreed that the Grade 1, $1 million Ricoh Woodbine Mile, which will be run this year on September 15, could be an interesting long-term target. 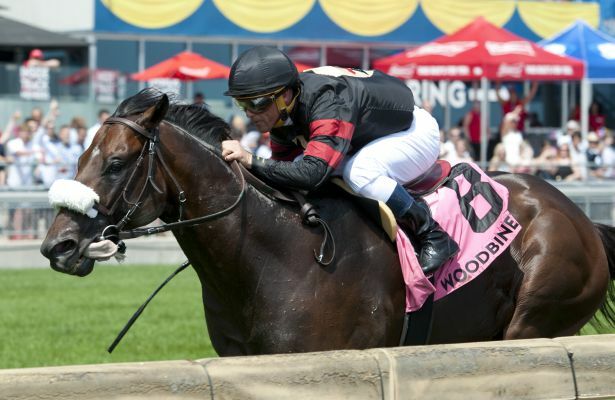 “I think the Woodbine Mile would suit him,” said the owner/breeder. Delta Prince returned $6.30, $4.30 and $3.30 and combined with Shakhimat ($16.80, $8.90) for a $100.10 exactor. Conquest Panthera ($4.20) completed a $2 8-5-6 trifecta worth $559.30 and the $1 8-5-6-7 trifecta with Caribou Club came back at $831.85.